I spotted Battersea Arts Centre’s impressive, historic building from the train, like a beacon of culture! A mere oyster hop and skip from Clapham Jct – all trains out of Waterloo stop there, so it’s an ideal location. We stopped for a quick bite to eat at the nearby Pizza Express beforehand but this part of town is teeming with choice for places to eat – familiar favourites as well as new spots to try! Venturing out with the seasoned theatre go-ers of my family, this was the perfect occasion to get together and in the unique space of the Battersea Arts Centre’s courtyard. 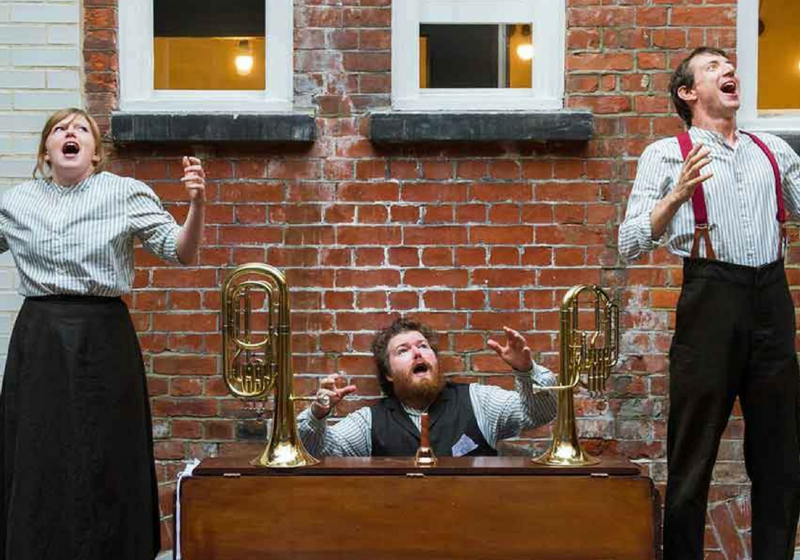 As a former Victorian town hall, it may seem an unlikely venue for an outdoor performance space but it works really well, especially for this playful production. The plot was cleverly interspersed with sight-gags and revelry – and combined with the quirky venue, the performance had that awesome, classic feel of Musical Hall about it. Music, song and tons of laughs were delivered aplenty, so much so that we didn’t want it to end! It was a production that made me proud to be a Londoner. Very clever – well done Battersea Arts Centre…another fine mess! That’s Dog Dog spreading confetti from Heaven when he became an angel – you really have to see it…! Get 30% off on LittleBird here!